I’m ripping CDs, consolidating files, and getting new music through Amazon to have a music collection that’s not just big, but organized. Now that everything’s backed up, I’m adding things back a bit at a time to make sure everything is properly tagged. (I’d love the superpower to tag mp3s correctly by, like, sticking an Ethernet cable under my tongue.) I’m adding some of my favorite music from every year to start things off. When picking a year to start off with, it didn’t take long to pick 1979. The bestselling albums of that year–Billy Joel’s 52nd Street, the BeeGees, the Cars, Supertramp–don’t particularly interest me. But oh, I love the music bubbling under the surface from that year. Talking Heads’ Fear of Music incorporated ringing guitars in songs like “I Zimbra,” “Life During Wartime,” and “Heaven.” On Drums and Wires, XTC began to forge their own clever, quirky sound from the hyperactive electropunk that had gone before. The Clash, already one of punk’s best acts, incorporated reggae, ska, and American styles on the double album London’s Calling. The Cure and the Specials came out with their first LPs in 1979. 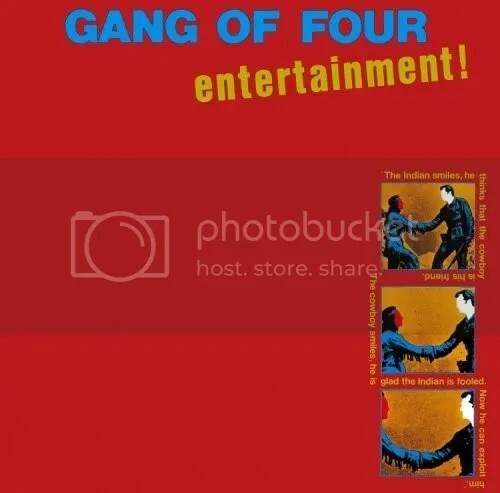 And Gang of Four released the bracing, challenging, even off-putting Entertainment!, the beginning of modern indie rock. There was plenty of great music before this, but 1979–the end of punk, disco, and maybe even “classic rock”–feels like the beginning of MY music.